This spring, all the roses in our garden seemed to bloom at once: Ebb tide, which is fragrant and colored a deep purplish red; Sunsprite, a pure golden yellow; Julia Child, buttery of course, with pink edges; Cecile Bruner, a small, pale pink climber; a large rugosa type, name unknown with dark pink blossoms, said to be the best kind for making perfume; several peachy, fluffy David Austens; and quite a few others. Then, in late May and for all of June, the roses took a rest. It’s so disappointing after their show; I miss them. Now they are blooming again – though not quite as spectacularly – but enough to make another batch of rose syrup, with blooms to spare. 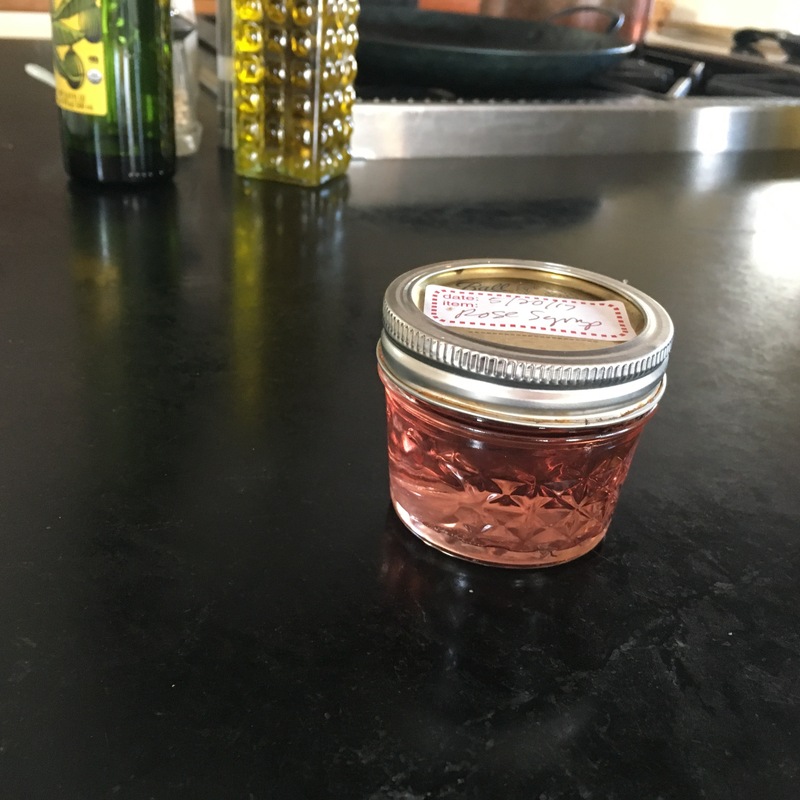 Rose syrup is so easy to make. You make a tea, or “tisane”, by pouring boiling water over freshly picked and cleaned rose petals. Steep for about an hour, and then, while the tea is still warm, add lots of white sugar, which dissolves into a rose-flavored simple syrup. I use rose syrup to make a mixed drink called the Southern Rose, with passion fruit flavored vodka and pink guava puree (a recipe shared by a bartender in Atlanta). Or I make a refreshing non-alcoholic drink rather like an Italian soda: a few teaspoons of rose syrup added to carbonated water, with perhaps a squeeze of lemon or lime. 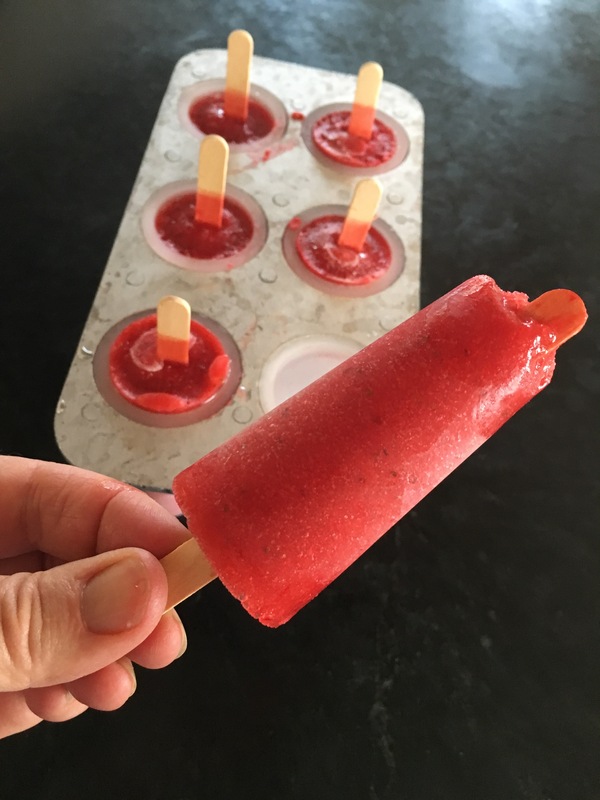 Or you can add the rose syrup to pureed strawberries, then freeze – to make a strawberry rose sorbet, or decadent strawberry rose popsicles. There is one simple trick for making the syrup beautiful: you’ll want to use a good handful of red or dark pink rose petals. 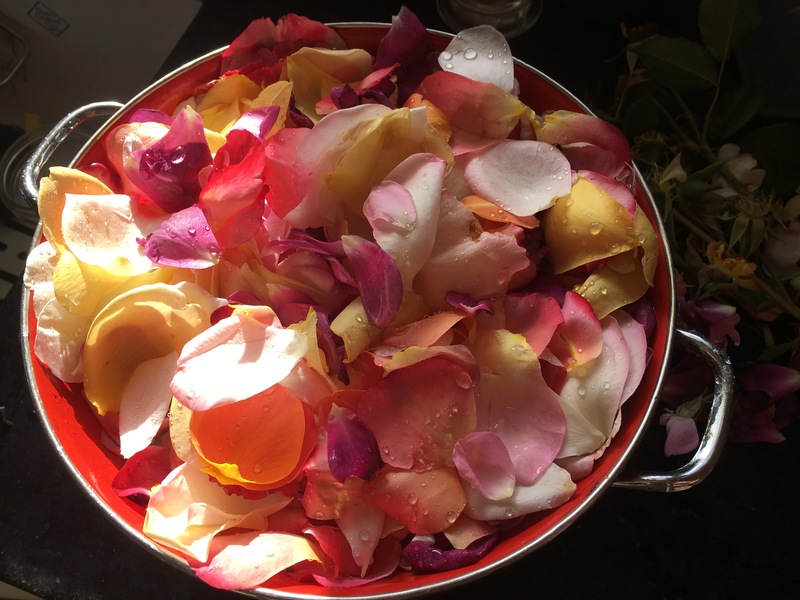 You’ll also need most of the rose petals to be the fragrant kind, though I use quite a mix. In my last batch I used Double Delight, Polka, Julia Child, Disneyland, Ebb Tide, Cecile Bruner, George Burns, Honey Perfume and Golden Celebration. I also threw in some non – fragrant white icebergs – just because I have them and thought they would add a subtle rose flavor. But to kick up the color I added a large handful of Altissima, an unscented red climber. It blooms steadfastly all summer. The petals are large and open, and their color is an electric red, just the color needed to give my rose syrup a “rosy” blush. Stem strawberries and cut into halves or quarters, if large. Add them to a blender container or food processor along with rose syrup and vanilla. Blend until smooth. Pour into popsicle maker, and freeze until firm.